A high hairline can lead to self-consciousness and a lack of self-confidence because it can detract from the symmetry of your face, giving it an unbalanced appearance from top to bottom. Unfortunately, many people who have a high hairline are unaware that a procedure exists for both women and men that reduces the size of the forehead and effectively lowers the hairline. Deciding to get a hairline lowering procedure, often called forehead reduction or hairline advancement procedure, can vary on many factors and begins with a consultation with expert, board certified facial plastic surgeon Dr. Jason Champagne. During your consult, he will review your medical history and perform a physical exam. Be prepared to answer questions about current and past medical conditions. Talk about any medications you are currently taking or have taken recently, as well as any surgeries you have had. It is extremely important to tell us if you are allergic to any medications. To determine your treatment options and candidacy for hairline lowering, Dr. Champagne will examine and measure areas of your face including your forehead to determine overall symmetry and balance. In addition, you will take photographs for your medical record. During your consultation, Dr. Champagne will discuss with you your reasons for wanting forehead reduction and what your expectations are in terms of appearance after the procedure. You will also be able to view a large collection of approved before and after photos of Dr. Champagne’s patients. Making the decision to explore your options for lowering your hairline is the first step in preparing yourself for the hairline advancement procedure. From there, we will assist you with the steps to take in order to fully maximize your completely natural looking results, helping to give you your self-confidence back. Please contact Dr. Jason Champagne to schedule a personalized, confidential consultation in which Dr. 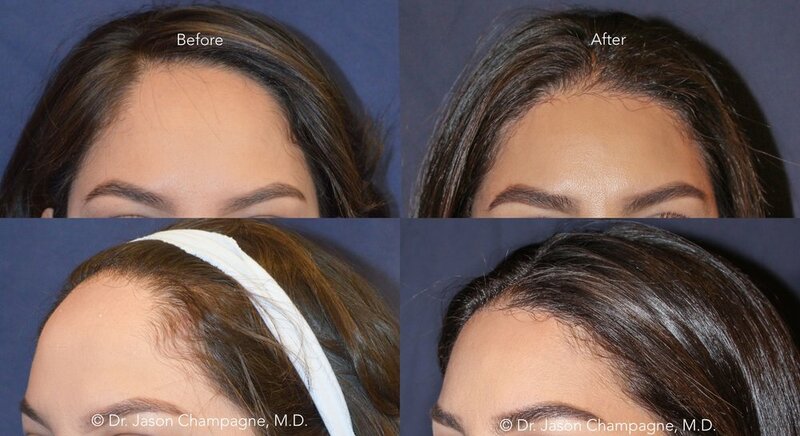 Champagne will address your goals and answer any questions you may have regarding a hairline lowering procedure or any other procedures we offer.